I'm sure you've heard one or two of the health benefits of green tea: lowers cholesterol, lower caffeine than coffee, maybe even anti-cancer properties. Those three are true, but beyond that, it is great tasting, and in fact, if you purchase from the right supplier, the diversity of breeds and tastes can be similar to wine. I have been ordering from a company called HIBIKI-AN for ten years now whose reliability, consistency, customer service, and of course tea quality is second to none on the planet. They grow, harvest, age, process, and ship directly from their farms in Kyoto Japan. You might think their prices are steep for 100 grams, but a little goes a long way, (like one teaspoon for 3 cups), and the quality is far superior to anything you can buy locally. If the cup you brew has a brownish tinge to it instead of vibrant green, it's time to try real Japanese Green Tea. Treat yourself. - Its Tannin (Catechin), is a bioflavanoid with potent anti-viral, antioxidant properties, and anti-cancer properties. - Helps 'clean your blood' and vascular system and possibly preventing cholesterol buildup, clots, heart attack, and stroke. - Tea is the only plant that makes the amino acid Theanine, also known as Teanin or L-Theanine, which stimulates alpha brain waves associated with a relaxed but alert mental state allowing one to focus on the task at hand. -Tea is rich in minerals, including manganese, potassium and calcium, which help to alkalinize the blood, regulate the heartbeat, and build strong teeth and bones. 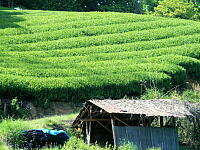 The two most popular green tea breeds are Sencha and Gyokuro. Sencha is typically spicier and fuller, gyokuro mellow and grassy. Personally, I choose Sencha Fukamushi, a combination of the two, which also is cost-effective. Although it may seem like a pain to follow these rituals, if you are paying for really good tea, like wine, you want to enjoy the taste to its fullest extent. These four tips become habit in no time. 3. Use a good tea basket that does not allow the leaf contents in. Finum is the best. 4. Let the leaves steep only 60-90 seconds. As mentioned above,one tablespoon is good for 3 brews. Just like food, there are a ton of supposed green teas lining your supermarket and health food shelves. I have yet to find one, (aside from specialty tea stores), that offer the color and taste of Hibiki-an. Don't shortchange yourself thinking the Celestial Seasonings green tea is donating any health benefits. The Hibiki-an website has more information on tea than I could ever elaborate on or convey accurately. Check out the various pages such as 'Green Tea For Health", 'Choosing a Japanese Green Tea', and the other links in their sidebar to learn all about them and what tea you might be suited to.